The US Navy is facing a shortage of aircraft carriers in the Western Pacific and Middle East as it attempts to scale back the duration of carrier deployments. Carrier deployments have grown over the years from six months to 10 months or more, with Navy leaders reporting that this has reduced the service lives of the massive vessels . The scaleback comes amid debate over whether the US has enough ships to meet the challenges posed by an increasingly aggressive Chinese Navy  in the South China Sea. Meanwhile in Beijing, China has commissioned its latest icebreaker, Haibang 722,  three years after construction started. The icebreaker will be assigned to the Chinese Navy’s Northern Fleet and will patrol the Bohai Sea. The vessel is 103.1 meters long  and 18.4 meters wide with a full-load displacement of 4,860 tons and a maximum speed of 18 knots. The Haibing 722 is the first of a new class of icebreakers and is part of a broader effort by China to pursue its interests  in Arctic and Antarctic waters. Finally; be sure to check out DefenseNews’ detailed article on the amphibious vehicles that won the Marine’s US$225 million contract . The US flew a B-52 bomber over South Korea on 10 January in response to North Korea‘s nuclear test last Wednesday. The B-52 was flanked by two fighter planes, a US F-16 and a South Korean F-15 , and flew over Osan Air Base before returning to Andersen Air Force Base in Guam. Read the US Forces Korea official statement on the extended deterrence mission here . Meanwhile, check out ASPI’s Peter Jennings on why the nuclear plans of North Korean leaders show that they’re bad but not mad , and CNAS’ Patrick Cronin on how to help Pyongyang save face by backing down from nuclear provocations . Indonesia and South Korea have inked two new deals for the joint development of the new Korean Fighter Experimental (KF-X) 4.5 generation fighter jet by Korean Aerospace Industries. DefenseNews takes a look at the announcement , reporting Indonesia’s Defense Ministry will invest approximately US$1.3 billion in the program. Prashanth Parameswaran at The Diplomat also takes a look at the deal here . Quick look: Introducing the US Air Force’s Top 10 Priciest Planes (To Fly) . Rick Smith over at The Motley Fool takes a look at the most expensive US aircraft to fly, the companies that make them and the implications for investors. Albert Palazzo, Director Research in Strategic Plans Army, has published a new research paper entitled ‘Forging Australian land power: a primer ’. It’s intended as a guide for those thinking about the future of the Australian Army, providing analysis of historical trends in Army’s capability development, policy and structure. Controversy continues over the decision to open all combat roles to women in the US military. Marine Corps General John Kelly, commander of US Southern Command, recently opined  that the decision was likely to generate pressure to decrease military standards. Kelly supposes a future  in which physical standards are lowered to allow female infantry troops to advance professionally. The Marine Corps has also been directed  to improve gender integration in boot camp and to make all job titles gender neutral. We Are The Mighty lists the five most legendary snipers of all time . American Sniper author Chris Kyle comes in at number three, and fourth place belongs to Soviet sniper Vasily Zaytsev, famously depicted by Jude Law in Enemy at the Gates. Check out the full article  to see who takes the gold medal. Alice Slevison, Mercedes Page and James Mugg are research interns at ASPI. 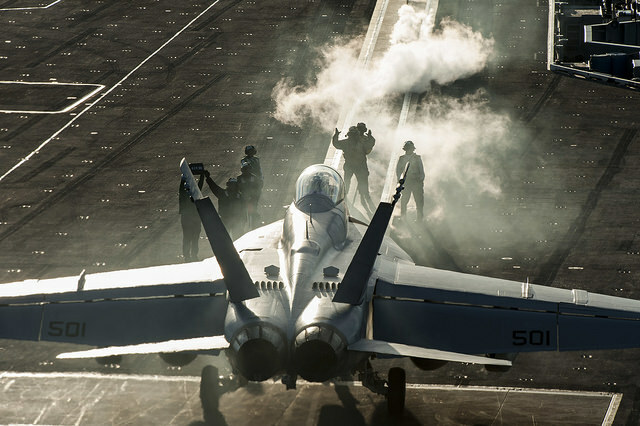 Image courtesy of Flickr user US Navy.